Ruger Tails: Ruger Finds a Home is based on a true story of a Pit Bull rescued by two unsuspecting dog lovers. Kristin and Ben went on vacation to Sarasota, Florida in the summer of 2012. They decided they wanted a dog and what better place to find one than in the beautiful state of Florida. After looking at all of the dogs in the pound, Kristin and Ben knew that Ruger was the right dog for them. Ruger was a ten-month-old Pit Bull mix and Kristin and Ben had an instant connection with him. He seemed like the sweetest dog, and he was, but Kristin and Ben didn’t know what they had gotten themselves into. Ruger was a high-energy, free-spirited dog with much love and affection to give. This also meant that Ruger got into a lot of trouble. The first years with Ruger were unlike anything Kristin and Ben could have ever predicted. Ruger got into more trouble than ever imaginable, doing things that puzzled everyone, but looking back we can finally laugh at his unique personality and the way he chose to express himself. 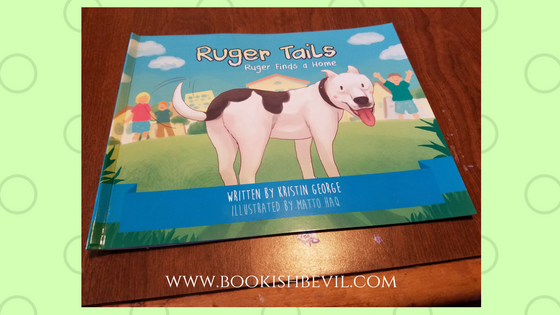 Ruger Tails: Ruger Finds a Home is a story about Ruger’s huge personality and will take you on a new adventure in each story, exploring all of Ruger’s silly behavior. We hope you fall in love with Ruger the way that Kristin and Ben have and grow to feel a special bond with him through the funny situations Ruger gets himself into. As the mom of 4 kids, I was thrilled when author Kristin George wanted to send me a copy of this series starter for review. I mean- What better book to read to my kids than one about a pup who just happens to be the same breed as 2 of their furry companions?! Ruger is a Pit Bull & so are our doggies Lexus & Nitro. I want to thank Kristin for touching on one of the biggest stigmas that come with the Pit Bull breed- that they are a dangerous breed. She, along with illustrator Matto Haq, do a wonderful job of showing that no all Pit Bulls are mean or should be feared. In fact, many are the complete opposite. I know that personally, my mom has a chihuahua who I'm more nervous for my kids to be around than my 50 & 60 lbs Pits. Another thing that I love about this book is Ruger's personality. He has those goofy, unpredictable tendencies that I have witnessed first hand from my own dogs. There's so much personality within Ruger that he just can't help himself. He'll have you crying, laughing, & sitting on the edge of your seat. And that's just while reading the first book! I really could go on & on about this book. After I read it to my kids, the youngest (3) carried the book around for at least an hour flipping back through it. Not only was it a winner in my book, but they all seemed to love it as well. Definitely can't wait to see what Ruger gets himself into next.